Woman In Digital: T.G.I.Friday's 20th Anniversary: Win #JackDaniel's Burger! 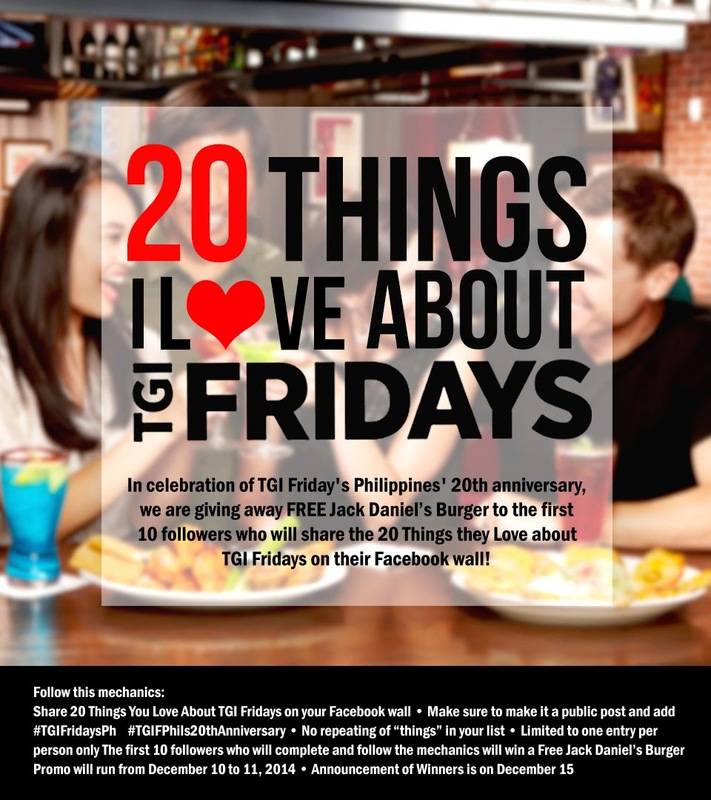 T.G.I.Friday's 20th Anniversary: Win #JackDaniel's Burger! When in T.G.I Friday's, be sure to order their signature burger, Jack Daniel's. Deliciously packed with 7oz burger glazed with Jack Daniel's sauce, added with strips of crispy bacon and American cheese. It's very filling, I can share it to a friend. The restaurant has brand-new look, modern but still serves all time great burgers and signature dishes. Still your go-to restaurant for after-office hangout and reunions, it has now evolved as your family-friendly, craving-solver restaurant. List down 20 things you love about T.G.I.Friday’s on my blog's comment section. Share this blog post on Facebook or Twitter. Don't forget to tag me www.facebook.com/LivingMarjorney / or www.twitter.com/LivingMarjorney and T.G.I.F on Facebook. Make sure to make it public and add hashtags #TGIFridaysPh #TGIPhils20thAnniversary. No repeating of things in your list. Only the first nine (9) who will complete and follow the mechanics will win a FREE JACK DANIEL'S Burger. Contest starts today, December 10-11, 2014 only. Winners will be announced on this blog on Dec 15. Include the link of your social media post on the comment section. The first nine (9) valid comments will win! Winner will receive one (1) tasty, yummy Jack Daniel's Burger (P495). Open to all but preferably residents of Metro Manila, Angeles City, Cebu, Davao, CDO, Subic where T.G.I.Friday's are available. Shareable Platters for big groups and families. Great Savings! TGIF and other Bistro Group restaurants always offer promos and discounts! Update: The winners of Jack Daniel's burgers are posted on this blog, click here. 5. sweetness overload. Oreo Madness FTW! 10. there's an activity ready for kids! 1. Perfect bonding for family, friends especially for all occasions! 5. Good music/entertainment while eating. 9. Fast and friendly crews, approachable! 13. The amount of servings! 1. Who doesn't love Fridays? 13. Did I mention great foods and food choices? 14. It's a complete weekend hangout - dine, wine and relax with friends and family. 15. French Onion Soup, let's not forget. 16. And they have Chipotle Yucatan Chicken Salad! 17. There's always great promos and deals! 18. Having a party? No problem! They have great party package selections. 19. You don't have to go to the US to taste great American foods. 20. Php20 chicken fingers for their 20th anniv! 10 Things I love about T.G.I.Fridays..
1.They have good foods.. a really Superb! 2. Music is really great! if you’re a regular guest they know your name. TGIFriday's Philippines Happy 20th Anniversary! bat nadelete po yung comment ko kahapon? 20. place that i really enjoy my food. 9. Cake is free if it's your birthday! 18. Designs are unique and stylish! 20. Where Anne Curtis ate!!!! !